Over the past few days it has been impossible to go to sleep comfortably due to the searing heat and high temperatures. Sitting, sweltering in humid, airless evenings has been unbearable. The thought of having to turn an oven on and subsequently heat up the house is quite frankly the last thing I’d want to do. Alas, even the ubiquitous summer staple; the BBQ, is making me want to jettison off to cooler parts. But one must eat and one must eat well. So inspired by the shimmering evening heat and the colour of summer, I offer you a simple yet stunning 2 course supper that bring all the colours and smells of the souk to your doorstep: cinnamon and lemon chicken pilaf followed by a refreshing lemon syllabub. 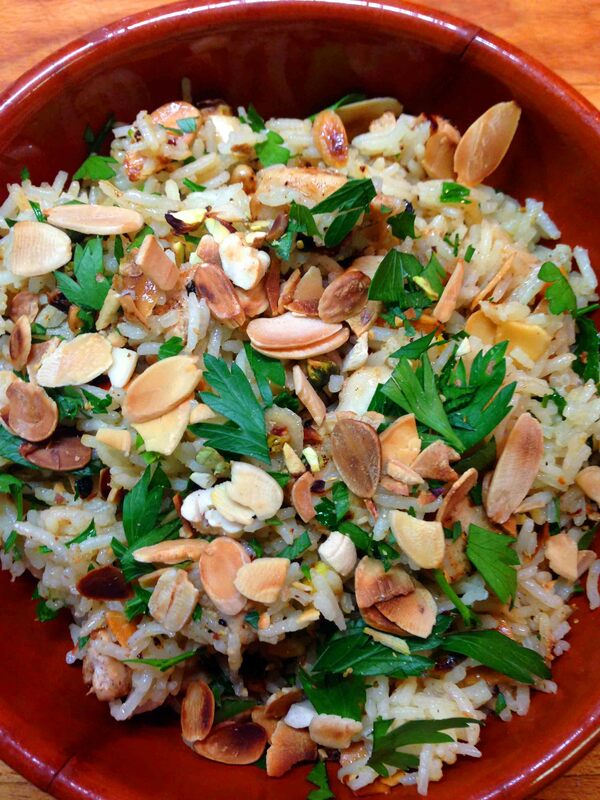 Pilaf, from Persian origins, is basically a rice dish with any vegetables, meat or shellfish added. When cooking anything Middle-Eastern, I cannot avoid adding toasted nuts to the dish, nor do I want to, as this adds to the resiny earthiness of the dish as well as a touch of exoticism. Feel free to add dry fruits or even rose petals as this can only enhance its intended decadence. The beautiful aromas and earthy colours make everything golden; as if a Sultan were to be joining you for dinner. 1st: Marinade chicken pieces (I used breast but have used boneless thighs before) in Greek yogurt, the juice of a lemon and a teaspoon of cinnamon (or alternative aromatics e.g. cumin, ground coriander, turmeric, mixed spice) for one hour or longer. 2nd: Prepare your chicken stock (add a glug of rosewater) with saffron strands to relinquish their warm ochre dye. 3rd: After an hour, drain the excess marinade off the chicken pieces and fry in batches to colour them. Once all the chicken is fried set aside and tend to the rice. 4th: I cook rice using the 2:1 method. 2 parts warm stock: 1 part basmati rice. Toss a couple of cardamon pods into the stock to release their spicy aromas as well as a good squeeze of lemon juice. 5th: In a dry pan, fry pistachios, flaked almonds and pine nuts until golden. 6th: Once the rice is cooked, mix everything together with freshly chopped parsley. I usually do this in the large frying pan I used to fry the chicken in so that all the charred-black marinade bits around the pan make their way into the final dish. A Tudor creation, the syllabub is a cloud-light yet aromatic dessert that is more a visual delight than a full blown pudding. 1st: Whisk a 254ml tub of cream with 4 tablespoons of icing sugar until it forms soft peaks. 2nd: Add a splosh (more if you want!) of limoncello liqueur and a squeeze of lemon juice. Fold this in gently, try not to make the cream any thicker. 3rd: Add a couple of tablespoons of lemon curd and ripple this in with the handle of a spoon. 4th: In a dry pan, fry flaked almonds with icing sugar until golden. 5th: Serve in chilled glasses, sprinkled with the flaked almonds. 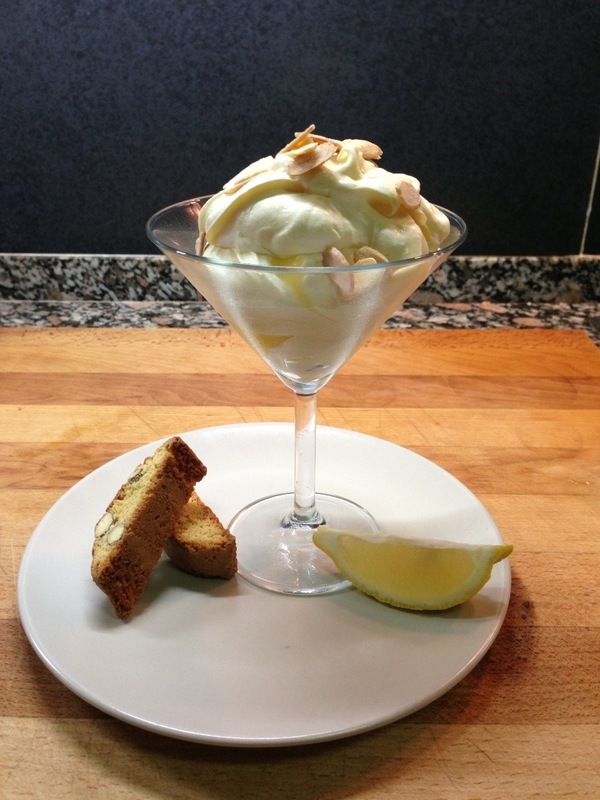 Provide biscotti or alternative biccies to scoop the cool cream into your mouth! Not even, Sheharezade, would be able to pull Aladdin away from the table with this feast! 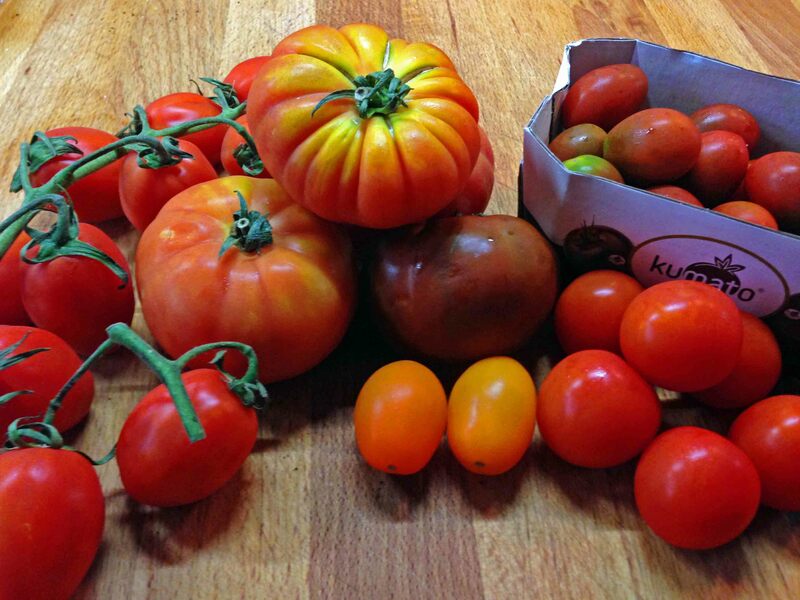 Be it the bleakest winter or the height of summer, there are always tomatoes. I’m not trying to be cloyingly obvious with the statement but surely if it’s in the sunnier months where the vegetable (or should I say fruit?) has had months of intense heat and sunshine to help it ripen and fill it with the goodness of the fertile soil and summer sun, it follows that this is when a tomato is at its best. Each fruit or vegetable has a prime time when it’s at its seasonal best. That means extra flavour, extra crunch, extra juiciness. So why is it that walk into any supermarket, grocers, corner shop, in the middle of winter, you will always find a tray, box or pack of plump, red tomatoes? They have been engineered for efficiency and convenience. They have probably been cultivated in a polytunnel/greenhouse. This artificial environment grows tomatoes that may look the part but do they actually taste like a tomato should if they haven’t been exposed to sunshine? Simple: No. These tomatoes will be firmer (able to withstand transportation bruising), full of water and tasteless! Chop tomatoes into different sizes depending on their variety, chop a couple of cloves of garlic, season, and a generous glug of extra virgin olive oil and some balsamic vinegar. Tear basil leaves and mix everything around so that the flavours get to know eachother. Do not serve cold. Admittedly, in summer is when you are going to get different variety of tomatoes in supermarkets and there are so many varieties around that each time you make the salad it will be slightly different. Serve this salad in winter and firstly it won’t be that appealing but mainly you will have a tasteless, watery salad. However, in summer the flavour will be much sweeter, juicier and the colours of the different varieties will make your salad come alive! 1) Cost Effective: as the produce is in abundance, prices are lowered to shift the volume that has been grown – any not sold get thrown out! 2) Nutritious: as grown in respective conditions, the product exhibits all its natural nutrients as the phytochemicals that give the fruit/vegetable its colour and give it its antioxidant properties are developed to their most effective. 3) Environmentally Friendly: seasonal fruit and veg don’t have to travel as far as when off season therefore reducing the amount of fuel needed to transport them. Chemical washes and wax coatings (used to protect the produce on long journeys) can be dispensed with. 4) Supporting the Community: Normally local producers are responsible for selling seasonal produce – its the large supermarkets that import from all over the world and charge an excessive price for tasteless fruit and veg. 5) Break the habit: Try to get into the habit of buying your fruit and veg from the public market or independent shops in town rather than from supermarkets. In Gibraltar we may not have areas for people to grow enough fruit and veg to sell but there are several people who try to grow their own produce. I know of a couple who purchase an organic veg box from a local gentleman who will supply them with a variety of his produce at a very reasonable price. Opening the box is like Christmas-come-early in anticipation of what you’ve got to cook with! Following the seasons can be difficult if you are already in a cooking pattern. But with a little imagination you might find that you rediscover something you always enjoyed eating but have stopped cooking. This not only applies to fruit and veg but to meat and fish too. I was once told by a fisherman to only eat sardines in a month without an R, namely May-August. The main reason being that April is spawning season hence we shouldn’t fish sardines before then for fear of depleting stocks and making it an unsustainable food source. Lamb becomes a desired menu item in Spring. Cheaper cuts can be served all year round but a joint of lamb is at its most flavoursome in Springtime. Eating seasonally leads us into a more sustainable eating system. Our main difficulty in Gibraltar is that most of our food is imported from the Uk or Spain by supermarkets. Buying organic is not necessarily buying seasonal. The fact that nothing sold is grown/reared here means that very little food we get is local. Our nearest sources of food come from Morocco and Spain. There is very little space to make ourselves available of allotments and ground share initiatives to grow our own. To find out what foods are in season at the moment click on the following link: www.eattheseasons.co.uk It’s a great site that not only gives you foods which are in season at the moment but also which wines are best during these months. With summer being the season of abundance now might be the time to give this a go. You might find, as I am sure I will, that you never eat a wintry tomato again.